X Marks the Spot (1942). In this film, a private detective who is also an army lieutenant pursues the killer of his policeman father and discovers traffickers in rubber. 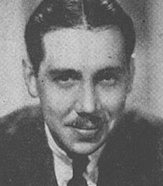 One of the film's screenwriters is Stuart Palmer (creator of spinster sleuth Hildegarde Withers). 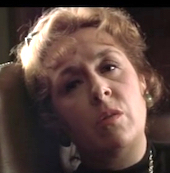 Doris Roberts on Brenner (1959). 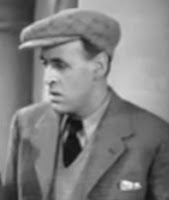 The Paley Center for Media offers a 1959 clip with Doris Roberts and Edward Binns from the police TV drama Brenner in honor of veteran character actress Roberts, who passed away on April 17. Inspector Hornleigh Goes to It (1941). In this film, Scotland Yard's Inspector Hornleigh (Gordon Harker) and his somewhat bumbling sidekick Sergeant Bingham (Alistair Sim) are on the trail of Nazi spies when murder occurs. This film is the third in a series (Inspector Hornleigh, 1939; Inspector Hornleigh on Holiday, 1939). 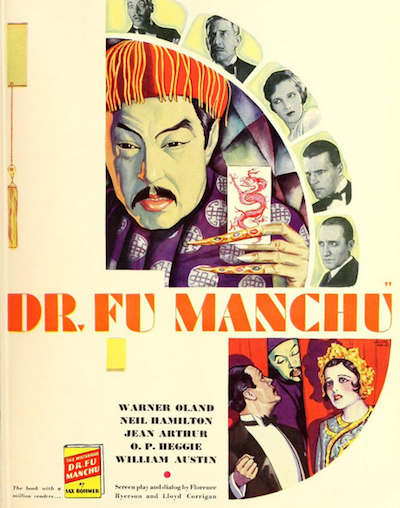 Houghton Library's Fu Manchu collection. In this blog post, Harvard's Houghton Library highlights its collection of volumes by Sax Rohmer featuring the nefarious Dr. Fu Manchu and discusses fears of the "yellow peril." One of the many adaptations of "The Turn of the Screw" by Henry James (whose 173rd birthday is April 15) was directed and produced by John Frankenheimer in 1959 for the Startime TV series. Ingrid Bergman played the governess who fears the effects of a malevolent influence on her young charges, and Paul Stevens was the servant Quint. Here are two clips from the program. Clues 34.1 (2016), a theme issue on "Reappropriating Agatha Christie" in commemoration of the 40th anniversary of her death, has been published; see below for abstracts. To order a print copy of the issue or to subscribe to the journal, email McFarland & Co.
Update, 4-26-16. The issue is now on Kindle, Google Play, and Nook. 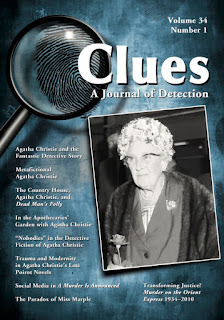 The Agatha Christie corpus has long been encumbered by agendas and critical perspectives that effectively prevent close analytical scrutiny of her novels. The authors explore possible avenues for a reappropriation of Christie and particularly highlight the need for irreverent rereading that brings to light the textual complexity of her detective fiction. Using the work of Pierre Bayard, this essay presents a “counterinvestigative” reading of Murder on the Orient Express (1934) that highlights the undermining of Poirot’s unshakable authority as a detective and his solution. The essay argues that the dénouement fails in accomplishing complete transparency and reducing the literary complexity of Christie’s plot. The author problematizes the restrictive categorization of Agatha Christie’s novel And Then There Were None via the critique by Tzvetan Todorov in his study on the literary fantastic. Christie’s work, she argues, overthrows the dichotomy between the natural and the supernatural as well as creates a fantastic detective novel. The author examines the narrative structure of The Murder of Roger Ackroyd, emphasizing the self-reflexive quality of the novel and seeking to establish its parodic intentions. Through the use of formulaic unreliability, clichéd characters, facile plot devices, and a comic detective, Agatha Christie deliberately constructs her text against the conventions of the genre. This essay compares the Agatha Christie novel Murder on the Orient Express (1934) and the Phillip Martin adaptation (2010). Viewing adaptations as transformations, the essay analyzes four differences; genre production, violence, justice, and Hercule Poirot, to argue for two differently rich texts sharing the same plot and characters across different media. 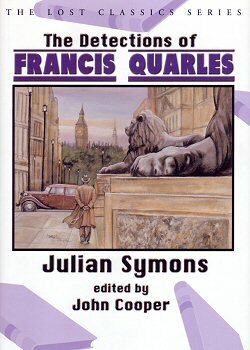 Symons's "The Mystique of the Detective Story" (1981). In March 1981 author-critic (Mortal Consequences/Bloody Murder, etc.) and then-Detection Club president Julian Symons (1912–94) delivered a lecture on "The Mystique of the Detective Story" at the Vancouver Institute, contrasting modern works with those of the Golden Age. He gave a humorous precis of a typical English country-house mystery and emphasized "the power of reason" in Golden Age mysteries. Symons discussed the work of Patricia Highsmith, noting, "Ripley is the horrific modern counterpart of [E. W. Hornung's] Raffles." He also dealt with the mysteries of P.D. James and Ruth Rendell as well as his own books. "Whatever its merits may be, [the crime story] does begin and end as sensational literature," he stated. He mentioned his admiration for George V. Higgins, as well as Maj Sjowall and Per Wahloo, and critiqued John Creasey. Symons considered Nicholas Blake (aka Cecil Day-Lewis) as one writer who bridged Golden Age and modern mysteries. M. Pamplemousse on BBC Radio 4 Extra. 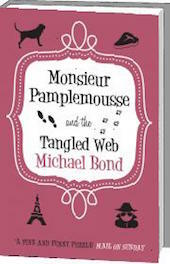 Featured this week on BBC Radio 4 Extra are Michael Bond's hapless sleuth Monsieur Pamplemousse and his faithful doggie sidekick Pommes Frites.